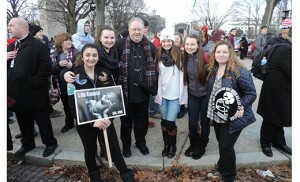 Several groups from the Diocese of Camden that participated in the March for Life in Washington Jan. 22 caught up with Bishop Dennis Sullivan. 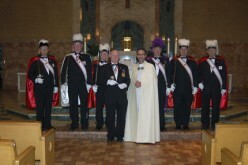 Above, the bishop stands with youth group members from Our Lady of Peace Parish, Williamstown. At bottom: Students from Paul VI High School, Haddon Township, and a group from Wildwood Catholic High School. 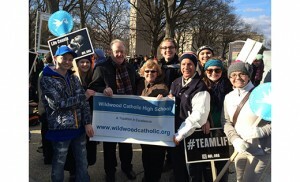 On Jan. 22, in Washington, D.C., and in the Camden Diocese, South Jersey Catholics, including Bishop Dennis Sullivan, marked the 42nd annual March for Life with their voices, feet, prayer and hashtags, standing up for the sanctity of human life. 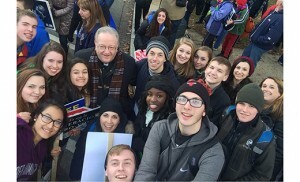 On the corner of Constitution and New Jersey avenues, Bishop Sullivan, with Father Michael Romano, diocesan director of Vocations, and Michael Jordan Laskey, diocesan director of Life and Justice, greeted, and snapped photos with, marchers on their way to the Supreme Court building, on their way from the National Mall, where they had heard impassioned speakers protesting Roe V. Wade, the 1973 Supreme Court decision that legalized abortion. 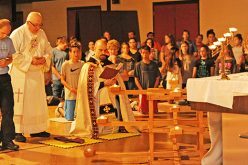 Pouring out of parish and high school buses, subways and other vehicles, the diocesan contingent joined tens of thousands in Washington. In recent years, the March for Life has had a pronounced youth movement, a fact not lost on Megan Walheim, a senior at Rowan University, Glassboro, who made the trip with the school’s Catholic Campus Ministry. “The dances, chants and cheers for life I heard, while marching, and the joy I saw in the people fighting for this cause, was inspiring and encouraging,” she said. 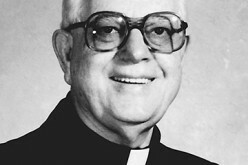 “The march is an important witness,” elaborated Father Robert Sinatra, chaplain for Rowan’s Catholic Campus Ministry, who joined Walheim and other students. “With people in this world so focused on what’s unimportant, the march is a witness to the sanctity of human life from natural conception to natural death. 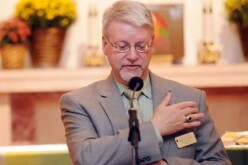 It’s important to speak up for those who can’t speak for themselves,” he said. 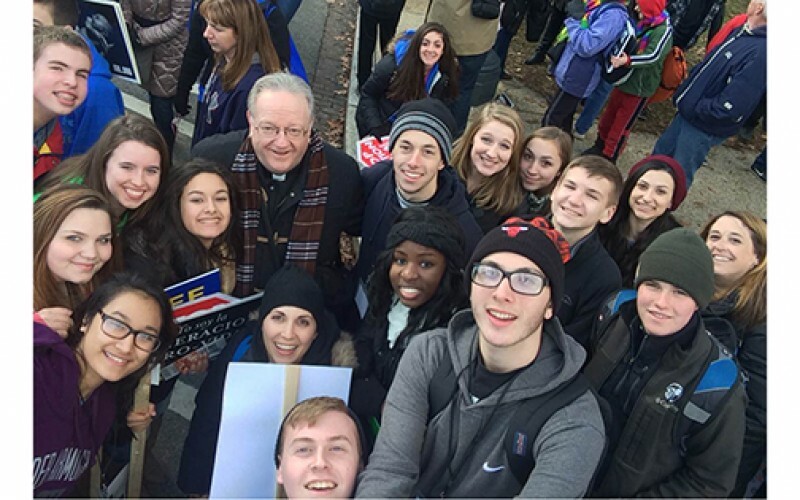 Around 40 youth and young adults from Our Lady of Peace Parish in Williamstown also made the trip, attending a morning youth rally and Mass for Life at the Verizon Center, before making the trek down Constitution Avenue. Holding up high signs saying “Stop Abortion Now” and “I am the Voice for the Voiceless,” youth also made their message known on social media, joining others showing their support for the march with the hashtag “IStand4Life” on Instagram and Twitter. From Cherry Hill, 120 students from Camden Catholic High School travelled in three school buses to D.C., and the day made up an out-of-classroom teaching moment. 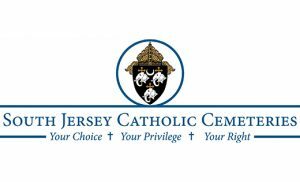 For those who couldn’t make the trip to Washington, Our Lady of Guadalupe Parish in Lindenwold held a pro-life rosary, Mass and exposition of the Blessed Sacrament that evening, offering “thanksgiving to God for human life, and to pray for the reparations of the sins against human life,” said Father Joseph Capella, parish pastor and celebrant. See photograph at left. 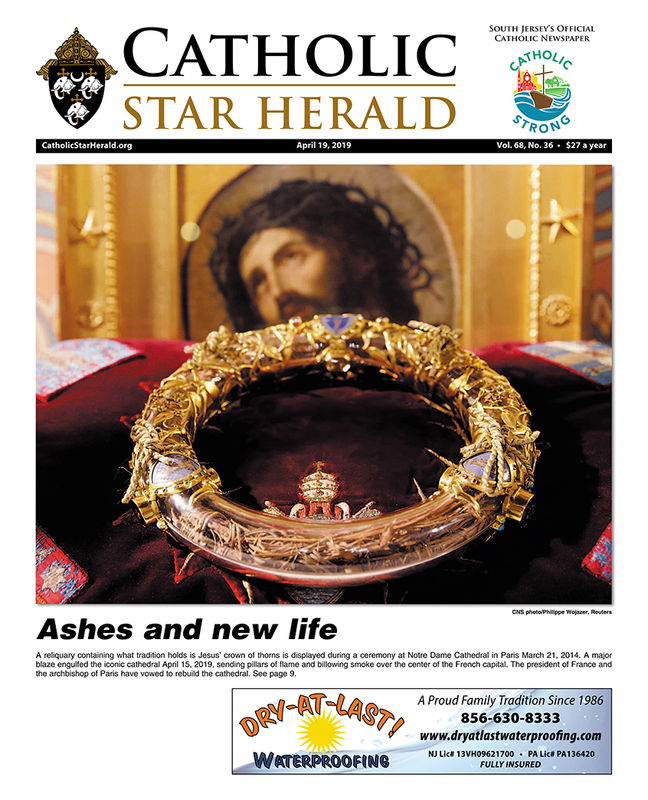 “Pro-life means addressing (such issues as) abortion, poverty, lack of education, and inadequate healthcare,” he said to the gathered, which numbered more than 80. Addressing the crowd after Mass, shortly after returning from Washington, Michael Jordan Laskey called the march “a powerful sign of hope and joy” and reminded all of Mary’s “yes” to human life, in accepting her role as the Mother of God, and her “no” to injustice.